<strong>GET ORGANIZED IN STYLE</strong>: A smart way to carry your keys in style. No more embarrassing jingles, no more bulky key rings and no more hunting for keys. You will find every key right at your convenience. <b>GET EXCEPTIONAL QUALITY YOU DESERVE</b>: Made from premium grade aluminum casing, extra strong stainless steel screws and Hard-Anodized finish for everlasting durability. 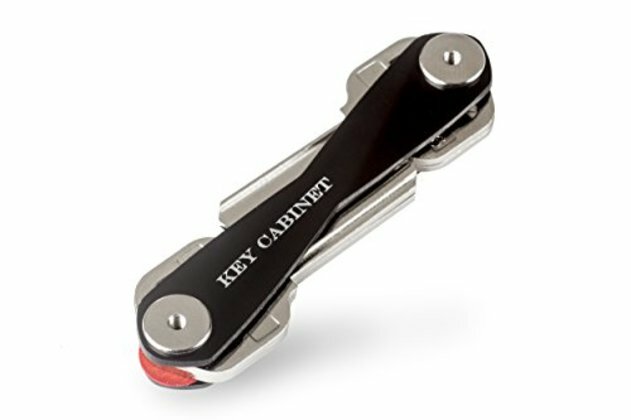 <b>INCREDIBLY VERSATILE</b>: The minimalistic design inspired from the Swiss army knife makes this an ideal multipurpose tool for a wide selection of accessories like USB, Screw Driver or Bottle opener (Not Included). <b>UNIVERSAL & EXPANDABLE</b>: Designed to fit almost every key and a simple expansion holds 2-10 keys. Includes loop ring to attach the car keys or fobs. <b>SATISFACTION GUARANTEED</b>: Your satisfaction is our top priority and we'll endeavor to maintain our status of 100% customer satisfaction. We're confident that you will be pleased with our product. For any reason if you're not satisfied with our product, we'll refund or replace your purchase. We provide 60-day money back guaranteed. GET ORGANIZED IN STYLE: A smart way to carry your keys in style. No more embarrassing jingles, no more bulky key rings and no more hunting for keys. You will find every key right at your convenience. GET EXCEPTIONAL QUALITY YOU DESERVE: Made from premium grade aluminum casing, extra strong stainless steel screws and Hard-Anodized finish for everlasting durability. INCREDIBLY VERSATILE: The minimalistic design inspired from the Swiss army knife makes this an ideal multipurpose tool for a wide selection of accessories like USB, Screw Driver or Bottle opener (Not Included). UNIVERSAL & EXPANDABLE: Designed to fit almost every key and a simple expansion holds 2-10 keys. Includes loop ring to attach the car keys or fobs. SATISFACTION GUARANTEED: Your satisfaction is our top priority and we'll endeavor to maintain our status of 100% customer satisfaction. We're confident that you will be pleased with our product. For any reason if you're not satisfied with our product, we'll refund or replace your purchase. We provide 60-day money back guaranteed.